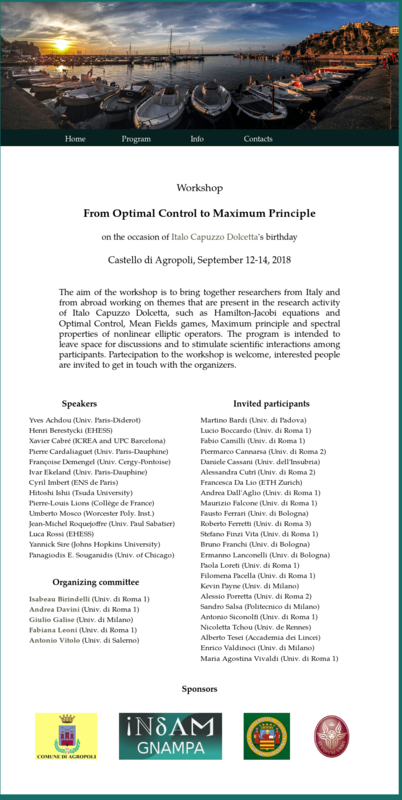 A workshop entitled From Optimal Control to Maximum Principle will be held in Agropoli next September (12-14) on the occasion of Italo Capuzzo Dolcetta‘s birthday. The aim of the workshop is to bring together researchers from Italy and from abroad working on themes that are present in the research activity of Italo Capuzzo Dolcetta, such as Hamilton-Jacobi equations and Optimal Control, Mean Fields games, Maximum principle and spectral properties of nonlinear elliptic operators. « One year in Rio!